If you missed Part One, click here Whiskey Fun Facts and Trivia -- Part One. And yes, for my readers who read the first version this -- I got the message. Part One was so long that folks wrote to say so! So now this is a Part Two, and there is even more than before! So here we go, and yes, we may as well jump into the trivia by acknowledging that whiskey was used as currency during the American Revolution. In fact, George Washington operated a large distillery at Mount Vernon. It is said that given the distances and primitive transportation network of Colonial America, farmers often found it easier and more profitable to convert corn to whiskey and transport it to market in that form. It also was a highly coveted sundry and when an additional excise tax was levied against it. In the Old West, especially in newly formed towns where a saloons might be little more than a large tent, saloon keepers were known to serve up homemade whiskey which included such ingredients as "raw alcohol, burnt sugar and chewing tobacco". What is "Rotgut" whiskey? Well, it is said that saloon keepers in the Old West had to sometimes stretch their products to stretch their profits. Because of that, saloon owners were notorious for cutting good whiskey with turpentine, water, ammonia, cayenne, and even gunpowder. Their custom product was called by names like Tanglefoot, Forty-Rod, Tarantula Juice, Taos Lightning, Red Eye, and Coffin Varnish. Of course there were also Cactus Wine, made from a mix of tequila and peyote tea, and Mule Skinner which was made with whiskey and blackberry liquor. As Old West towns grew, hard liquor improved. In fact, saloons in towns like Tombstone Arizona often featured whiskey imported from the eastern United States and even Europe. When flush with money, patrons would avoid the cheap rotgut whiskey by requesting "fancy" mixed drinks. Bourbon whiskey -- made from mash that consists of at least 51% corn. Corn whiskey -- made from mash that consists of at least 80% corn. Malt whiskey -- made from mash that consists of at least 51% malted barley. Rye whiskey -- made from mash that consists of at least 51% rye. Rye malt whiskey -- made from mash that consists of at least 51% malted rye. Wheat whiskey -- made from mash that consists of at least 51% wheat. These types of American whiskey must be distilled to no more than 80% alcohol by volume, and barreled at no more than 125 proof. Only water may be added to the final product. The addition of coloring or flavoring is prohibited. These whiskeys must be aged in new charred-oak containers, except for corn whiskey which does not have to be aged. If it is aged, it must be in un-charred oak barrels or in used barrels. Corn whiskey is usually un-aged and sold as a legal version of moonshine. If one of these whiskey types reaches two years aging or beyond, it is additionally designated as "straight". Yes, as in "Straight Rye Whiskey." A whiskey that fulfills all above requirements but derives from less than 51% of any one specific grain can be called simply a "Straight Whiskey" without naming a grain. Bourbon is a $3 billion signature industry in Kentucky, generating 15,400 jobs with an annual payroll of $707 Million. Spirits production and consumption pours more than $166 million in state and local tax coffers every year. More than $1.3 billion in capital projects has been completed or is planned and underway in the next five years, including new distilleries and aging warehouses to bottling facilities and tourism centers. Bourbon production has increased more than 170 percent since 1999. That means 485,020 barrels in 1999 compared to 1,306,375 barrels in 2014 -- with premium small batch and single barrel brands driving the Bourbon renaissance. At 1.3 million barrels, Bourbon production in 2014 reached its highest mark since 1970, and a third straight year with a million barrels born. Total Bourbon inventory topped 5.6 million barrels in 2014, the highest it’s been since 1975. That means there are one million more barrels of Bourbon aging in Kentucky than the 4.4 million people living in that state. The 2014 tax-assessed value of all barrels aging in Kentucky is $1.9 billion – an increase of $81 million from 2013 and nearly double the value since 2006 ($1 billion). Nearly 60 percent of every bottle of spirits in Kentucky goes to taxes or fees, with seven different taxes on Bourbon – including an "ad valorem" tax on barrels each and every year it ages. Distilleries paid $15.2 million in barrel taxes in 2013, up 52 percent since 2006. United States distilled spirits exports topped $1.5 billion in 2013. Kentucky Bourbon and Tennessee whiskey made up more than $1 billion of that amount, making it the largest export category among all U.S. distilled spirits. Bourbon whiskey is made of mostly corn, so it's sweeter than other whiskeys. And yes, some get a chuckle knowing that Bourbon county is a "dry" county -- which of course means that they aren't allowed to sell any liquor. Jack Daniel’s whiskey is made in a dry county. The distillery is located in Moore County, in the city of Lynchburg, Tennessee. A dry county is one that allows no alcohol sales at all. The government of that county forbids alcoholic beverages from being sold in restaurants and stores in its jurisdiction. Locals who live in Moore County cannot purchase Jack Daniel’s close to home. But on the first Friday of every month, employees at Jack Daniel’s get a free bottle. Now, if you are a true lover of Jack Daniel’s Single Barrel Select whiskey, you can choose to take advantage of their "Buy the Barrel" program. Yes, you too can buy an entire barrel of whiskey. Believe it or not, for about $10,000, you get an entire barrel of the whiskey, specially bottled for you. You also get the actual barrel in which it was matured. And while the price tag is a little high, remember that barrel makes 240 bottles of whiskey. This comes out to about $42 per bottle and a free barrel to do with whatever you want. Because new, charred white oak barrels are used for every batch and maturing varies depending on the area of the Distillery where the barrel is stored, no two batches are ever exactly alike. Your bottles from the "Buy the Barrel" program will be completely unique to you. And as for those barrels, they have other uses than merely for whiskey. For example, whiskey barrels make Tabasco sauce possible. For years the basic diet of an American Cowboy is 4 very basic items. Whiskey, hot sauce, red meat and bacon. Without whiskey, two items of these food groups wouldn’t be possible. You need whiskey to have whiskey and you need whiskey to have Tabasco sauce. Yes, Tabasco sauce is actually aged in barrels that previously contained Jack Daniels whiskey. It gives the sauce an extra kick. Another important labelling in the marketplace is Tennessee whiskey, of which Jack Daniel's, George Dickel, Collier and McKeel, and Benjamin Prichard's are the only brands currently bottled. The main difference defining a Tennessee whiskey is its use of the Lincoln County Process, which involves filtration of the whiskey through charcoal. The rest of the distillation process is identical to bourbon whiskey. Whiskey sold as "Tennessee whiskey" is defined as Bourbon under NAFTA. and at least one other international trade agreement, and is similarly required to meet the legal definition of Bourbon under Canadian law. Malts and grains are combined in various ways. Single malt whiskey is from a single distillery made from a mash that uses only one particular malted grain. Unless the whiskey is described as "single-cask," it contains whiskey from many casks, and different years, so the blender can achieve a taste recognizable as typical of the distillery. In most cases, single malts bear the name of the distillery, with an age statement and perhaps some indication of some special treatments such as maturation in a port wine cask. Blended malt whiskey is a mixture of single malt whiskies from different distilleries. If a whiskey is labelled "pure malt" or just "malt" it is almost certainly a blended malt whiskey. This was formerly called a "vatted malt" whiskey. What is a Blended Whiskey? Blended whiskeys take whiskeys from multiple distilleries and combines them. Blended whiskey is made from a mixture of different types of whiskey. A blend may contain whiskey from many distilleries so that the blender can produce a flavor consistent with the brand. The brand name may actuallyleave out the name of a distillery. Most Scotch whisky, and Irish and Canadian whiskeys are sold as part of a blend, even when the spirits are the product of one distillery, as is common in Canada. American blended whiskey may contain neutral spirits. The normal ratio of malt to grain is 60% grain whiskey and 40% malt whiskey. 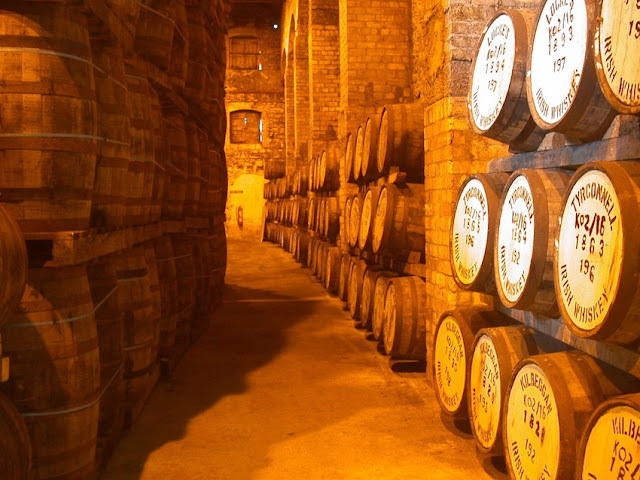 Each whiskey used in the blending process has usually aged for about 5 years. The point is to have it taste the same year after year. And as for variety, there are a number of Blended Whiskeys including Johnnie Walker, Dewar's, Seagram's Seven Crown, Jameson, and even Chivas Regal. Canadian whiskey is distilled any number of times using malted rye as the grain. "Canadian Club" was a massively popular whiskey during the 1950s. In fact, it is the only North American distiller to have been granted a Royal Warrant, which means it was recognized by the British crown for its excellence. That warrant has now been withdrawn. As for the latest fad of people drinking Fireball Whiskey? It was originally called "Dr. McGillicuddy’s Fireball Cinnamon Whisky." The booze started out as part of Seagram's and Sons line of flavored schnapps in the mid-1980s. It was called Dr. McGillicuddy’s Fireball Cinnamon Whisky, named for the mythical Aloysius Percival McGillicuddy, and it was only made in Canada. When the schnapps fad started to fade, Seagram's and Sons sold off its entire McGillicuddy portfolio to the Sazerac Company. Sazerac decided to repackage the cinnamon whiskey as simply Fireball in 2007. The sweet-hot cinnamon whiskey which tastes like candy is one of the most successful liquor brands in decades. And for you health conscious folks, with 11 grams of sugar, there are 108 calories in an ounce and a half shot of Fireball Cinnamon Whiskey. The calorie breakdown is pretty simple: 0% fat, 100% carbs, and 0% protein. In 2011, Fireball accounted for a mere $1.9 Million in sales in U.S. gas stations, convenience stores, and supermarkets. But, last year, 2015, retail sales jumped to $61 million, passing both Jameson Irish whiskey and Patrón tequila. And that number doesn’t include bars! Frankly, bars are making serious cash on Fireball shots. The liqueur retails for about $16 a fifth bottle, so if a bar sells $5 shots (which is the average ounce and a half shot), it’s in the money after three servings. Many places charge more. "We sell our shots for $8," says Scott Godino Jr., owner of Born & Raised, a bar in Las Vegas. "I know some places on the Strip that are selling them for $16 to $18." Now everyone is making cinnamon-flavored Fireball knockoffs. The company known for fielding me-too products now faces a wave of Fireball imitations from its more famous rivals. For example, Jagermeister has introduced a cinnamon-and-vanilla-spiced version of its German product. Jose Cuervo has created Cinge, a cinnamon-laden tequila. Jack Daniel Distillery began selling Jack Daniel’s Tennessee Fire, which is a 70-proof cinnamon variant of the world’s best-selling whiskey. But it’s not clear any of these spicy contenders will inspire the same Redneck mania that Fireball has. Yes, Redneck! 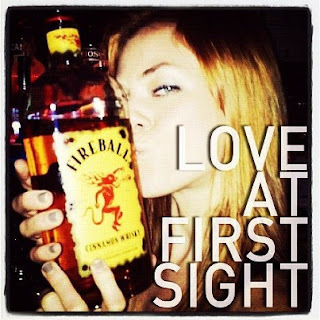 Fireball has become the "anti-Jager" go-to drink for college students who like its Redneck appeal. It is a drink that's breaking down gender barriers in that both guys and gals like it. Fireball's slogan is simple and to the point, "Tastes like Heaven, Burns like Hell." And yes, just the slogan itself makes Fireball sound like something for a hard-drinking renegade which is just the opposite of the 80 year old tradition of Germany's Jagermeister. The beauty of Fireball from a commercial standpoint is that it is a whiskey, but it's easy to take. And of course, along with drinking Fireball, there is the new craze of drinkers taking "selfies" with a Fireball bottle. Now, let's talk about farmers and whiskey, specifically why dairy farmers love whiskey distillers. You see dairy farmers love whiskey distillers because most dairy farmers near distilleries often pick up the discarded pulp of corn and other grains used to make whiskey -- then they use it as feed for the cows. Yes, it is a win-win situation, a truly symbiotic relationship. The distilleries dispose of excess grain waste and give the farmers a nutrient-rich feed for their livestock. And yes, that feed actually helps the cows produce more milk. This truly symbiotic relationship mirrors the relationship between whiskey drinkers and their choice of whiskey, or whisky! Everyone wins!